We’re just waiting for Jenny’s skin color on her left side to return to normal. Today was pretty simple. The only drama was with the ultrasound of the infected area. Jenny’s white blood cell count is back within normal range. And she felt pretty good for the bulk of the day. While many of the signs are positive, the doctors need to see the redness go away. That seems to be the final thing we are waiting for. Dr. Kronowitz ordered another ultrasound to make sure no pockets of fluid have developed. When the ultrasound technician arrived at 1:45 p.m., she was very nice, but said she didn’t know why they would order another ultrasound. Then she added that they tried to cancel the order for the ultrasound, but that she just came to the room for the ultrasound if that’s what they want. Around 3 p.m., the skin was still red — and Jenny was beginning to feel pretty worn down for the first time today. By 5 p.m., she felt a lot worse, was running a fever and her heart rate was elevated – all things that haven’t happened in awhile and that we considered forward progress. She’s hoping that the meds they changed a day ago didn’t cause the infection to gain strength. In other news, I took the second class to re-learn how to care for Jenny’s PICC line. I’m confident and ready, but I didn’t take the test. They rescheduled that for 10 a.m. tomorrow. They wanted Jenny’s skin around the PICC line to rest before I changed the dressing again. 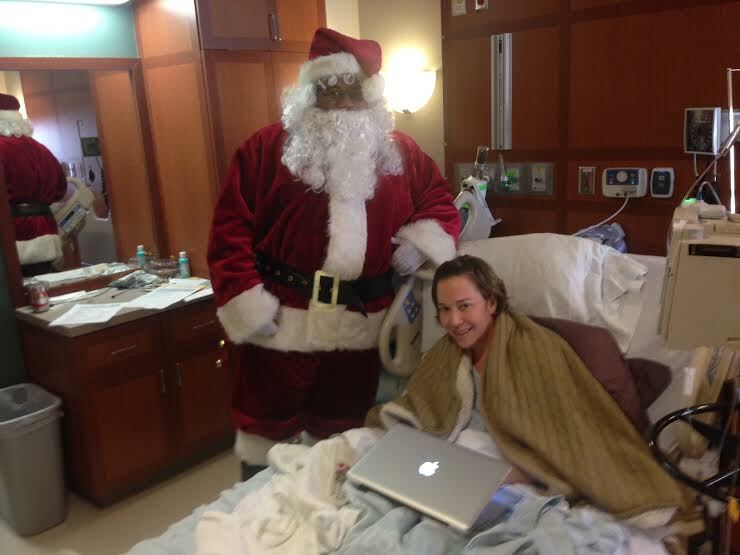 And finally, Santa came to visit Jenny. I think he visited other patients, but it seems like he was there just to see Jenny. As a side note, when he found out we were from Oklahoma City, he said that Big Truck Taco was his favorite place to go. Just FYI in case anyone needs to stock up on BTT queso to butter up Santa this year. This entry was posted in Recovery by Alan. Bookmark the permalink. Praying for that stinkin’ red skin/infection to go away! It is time to be done with this last surgery and go home! !